Dungeons & Dragons Online provides players with the definitive online Dungeons & Dragons experience, complete with dramatic dungeon crawling, terrifying monster combat, challenging puzzles and character advancement. 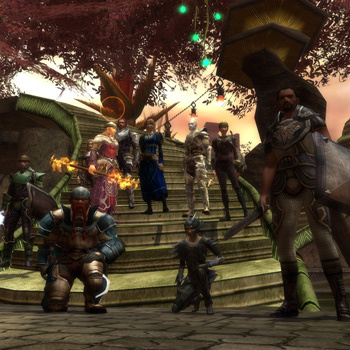 Dungeons & Dragons Online is centered on robust character advancement and challenging dungeon combat. Players choose and develop a character based on some of the iconic races associated with D&D, including Humans, Elves and Halflings, as well as classes such as Fighters, Clerics, Rogues and Wizards - after which they can socialize, find quests, group together and equip themselves for future battles. Dungeons & Dragons Online lets players travel alone or in parties as they explore the seemingly endless dungeon complexes found beneath the world. Through the dungeons, players engage in physical and magical combat with hideous foes straight from the pages of the Monster Manual rulebook. Battle is challenging, fast-paced, and easy to control with a wealth of unique weapon effects and character movements, as well as specific monster behaviors designed to keep combat both tactical and action packed.